While I was up near Tacoma, WA for work, I decided to look around for any nearby tracks. I mean, how often am I going to find myself out this way? 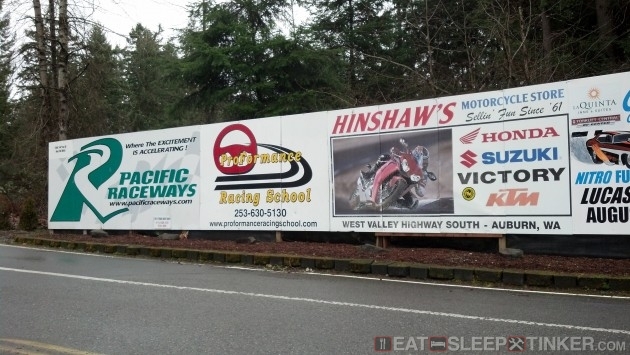 A quick search landed me on Pacific Raceways website, and what a stroke of luck; they were having a track day the last day I’d be in the area. I shot the organizer an email, explaining that I was only in the area for a bit, and only had a rental car. The organizer happened to be Don Kitch Jr, a pro racer who was out at Daytona for the Rolex 24hr. He was more than happy to give me a slot for the day, putting me in the advanced group based on my experience. Just asking that I show up a bit early on Saturday morning so he could give me a quick track orientation. I did a bit of course review to try to get an idea of the track layout, but maps don’t do it justice. The track is pretty old, but in no worse shape than one of my familiar tracks, TWS. What makes Pacific Raceways interesting is that it is a dual use facility, the front straight is actually part of a 1/4-mile drag strip. So it has a few oddities, like the staging lanes are part of a turn, and of course walls, lots of walls. I definitely wouldn’t want to drive anything real high end here, as there is next to no run-off areas, and where there are run-offs they are gravel traps. There is some pretty decent elevation changes, with a section that resembles mountain switch-backs. The back half of the track is tree lined with the large evergreens you find all over this area, making for more obstacles should you go off track. The track was a bit damp for the first session, not that my car had much problem with wet traction. See I was in a rental Ford Focus. No, not a Focus ST or some other sporty derivative, just a plain four door, automatic Focus with all season tires, in a horrible green metallic hue. Its engine was actually willing, but that’s where the praise ends. The car, as you’d expect, understeers horribly. It would plow every corner without forcing a little rotation with excessive trail-braking. You couldn’t use lift-off oversteer to rotation because the throttle response was extremely laggy, and the transmission shifted using a mapping based on a sun-dial. To make matters worse; I could defeat the traction control, but not the stability. So any bit of waywardness or even intentional yaw would cause the ABSto sputter and clamp various calipers in an attempt to straighten the car out. This combined with the excessive trail-braking left me with smoking brakes and a spongy pedal, to the point I was pumping them at every approach to the braking zones. I asked Don to put me in with the novices, just so I wouldn’t hold up the fast cars (mostly Audis up here in the wet PNW.) I ran until the brakes just couldn’t hack it anymore. I had a blast, despite the substandard ride. It’s always great to get out on the track, even better when it’s a new one.